It’s difficult losing a loved one or a friend. It seems even more so when you lose a hero. Someone who you saw as bigger than life. That is what happened to me this week with the passing of Percy (P J) Ponder. I was surprised to see that Barbara put his “real” name in the obituary. I recall when some of us found out his name. He made it clear, at least to me, that I could call him Mr. Ponder. I could call him P.J. but the consequences would not be favorable if we ever called him Percy. Believe me, none of us ever did. Barbara was the only one who could get away with it!! Mr. Ponder and Barbara moved to Yantis the summer before my sophomore year. I recall meeting them shortly after they moved. At that time, the superintendent lived in a house on the school grounds. I stopped by their house one day to meet them. Immediately, I knew that I was really going to like this man. We enjoyed the same things…..specifically baseball. Now I will say that I also realized that he wasn’t one to put up with any “stuff” from a bunch of knucklehead boys. He got his bluff in on me from day one and it didn’t change….EVER. P.J. was an encourager. He would always be around the gym or the baseball field. I can’t recall a ballgame of any kind that he missed. I wasn’t always the mild mannered person I am now (I can see some of you rolling your eyes). Anyway, I got booted from my share of basketball games over the years. It wasn’t a good thing. First I knew that Coach Cromer would have some additional bleachers for me to run the next day, but the real “treat” came almost instantly. Mr. Ponder would be in the dressing room waiting for me. Oh my, the number of times that I would have given anything to have had my clothes and keys….anything to avoid what was coming. He always reminded me of a drill sergeant. The flat top, the muscular build and “that look.” You didn’t need anyone to tell you when Mr. Ponder was mad. During our impromptu locker room meetings, he never whipped me, degraded me or screamed at me. He would have me sit down and would just look at me for what seemed FOREVER. When he spoke it was simply “I’m disappointed in you.” I’d rather have had the whipping that to let him down. Fast forward three years. Basketball was “the sport” in Yantis. While other schools were doing 2-a-day football practice, we were in the gym playing basketball. We won the district championship my senior year. He was as proud as a new papa. Somehow I felt like those times I had let P.J. down were finally rectified. The school year continued and so did the athletics. Track came after basketball. Now track wasn’t one of my favorite things to do and fortunately it wasn’t a big deal for the coaches or the school. The day before the district track meet they would tell us what events we would participate in. Track season lasted two days. Then…..then the big sport, as far as PJ was concerned, was upon us. It was time to break out the bats and balls. There was very few days that he wasn’t right out there practicing with us. Now I considered myself a pretty good baseball player. To this day I will never understand what I was thinking when I asked Mr. Ponder if he wanted to throw a few to warm up his “Old Arm.” He gave me this little smirk, backed up about 60 feet and started throwing cannonballs at me. I would never admit to him that I was scared to death. It was the only time in my life I was ever scared of a ball but this man was throwing SO HARD that I had to make every catch. As much as it hurt my hand, I knew it would kill me if it ever hit me. He got a big kick out of that…..I got a severely bruised hand. As the baseball year and the school year wound down, I got the greatest thrill of my entire athletic career. A couple of weeks before graduation PJ caught me in the hall and asked me if I’d like to play on his softball team that summer. At that time every town around had a men’s fast pitch softball team. I jumped at the chance to play on that team. I promise it meant as much to me for him to ask me to play as it would if the Texas Rangers had drafted me. I remember it like it was yesterday. Couldn’t wait to get home and tell my dad. Our graduation was set for June 1st. Our first tournament was scheduled to start the night of graduation. I tried to persuade Mr. Ponder that they would never miss him and I at the graduation. Since he was the superintendent he convinced me that wasn’t a great plan. Secretly, he wanted to play that night as much as I did. I wasn’t much of a praying person back then but I did pray for rain. Now I doubt my prayer had anything to do with it but it rain cats and dogs late in the afternoon of June 1st. The games had been cancelled until the following morning. You’ve seen the baseball movies where the main character is standing on the field and looks around in disbelief that it’s really happening? That was me. When we got to the field the next morning I had a uniform waiting on me. I had made the big leagues. I was playing on the same field and the same team as my heroes, P. J. Ponder, Gene “Red” George (my uncle), Richard Teer, Robert Clark, and so many others that I had heard about from my dad for so many years. These guys were bigger than life to me. Wouldn’t have mattered if their names were Mantle, Maris, Aaron or Ryan!! I was playing with those I looked up to. I reflect back on those 4 years that we played together and without a doubt they are among the most cherished memories of my life. 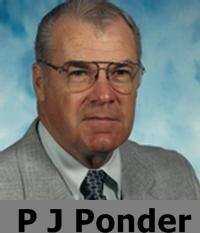 That’s ok Mr. Ponder, I will always remember you as a great man who influenced my life and who I will always be proud to call my friend. That is so sweet. Remember the fun times with Mr. Ponder as well. He will be missed. He believed in all the kids at Yantis I.S.D. Fly high with a perfect memory and body. We love you!!! He was a great role model and leader. I was only a second year teacher, and he taught me so much about kids. I was scared of him just like the kids were, and I would always turn red from my chest to the last hair on my head when I heard his gruff voice. However, he always had a smile and a kind word! I he was a joy and a blessing to work with.